Aside from the series and specials that Murray Street has produced for public radio, we’ve also had the pleasure of working with many artists on albums and CDs, including three which have been nominated for Grammy ® awards! "An extraordinary a cappella group!" said Spin Magazine. We produced two CDs featuring the nation's first openly gay a-capella ensemble, The Flirtations (seen in the film Philadelphia). 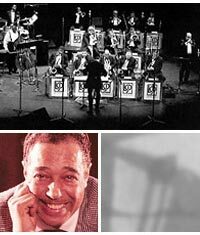 The Lincoln Center Jazz orchestra with Wynton Marsalis and special guests including Sir Roland Hanna, Marcus Roberts, Milt Grayson, Betty Carter, Kenny Barron, Jimmy Heath, Jay McShann, Christian McBride, Dianne Reeves and more. Limited Editions in a portfolio with illustrations by Dean Mitchell. liturgical music. Produced with Roadwork for the Melton Foundation. Coat of Blue, The Yellow Rose of Texas, Dixie and Battle Hymn of the Republic. Recorded live at Gettysburg College, includes "Ashokan Farewell" created by Ungar for Ken Burns' The Civil War' PBS documentaries. school students, the curriculum features teacher and student print materials and a video. Each year the Lincoln Center Jazz Orchestra hosts Essentially Ellington: a competition that brings high school musicians from all over the US to play the music of the Duke and have a chance at performing with the Orchestra!